You Were FIRST – Why Aren’t They Celebrating? Have you ever been to or seen the clips of that race where the runner was in first place, saw a teammate fall, ran back to help them and they hobbled over the finish line together with the entire crowd cheering them on? There is so much energy in the moment. The crowd is watching and almost willing the duo to finish strong, while the stronger runner is smiling and focusing on one goal – getting their teammate over the finish line. Someone actually won that race – they crossed the finish line first – but in our story, we focus on the runner who went back for their teammate. They become the real winner. That is what an Appreciate Inquiry session feels like. When the executives sit around a conference table and plan the goals for their organization in a strategic planning session, they go for the win. 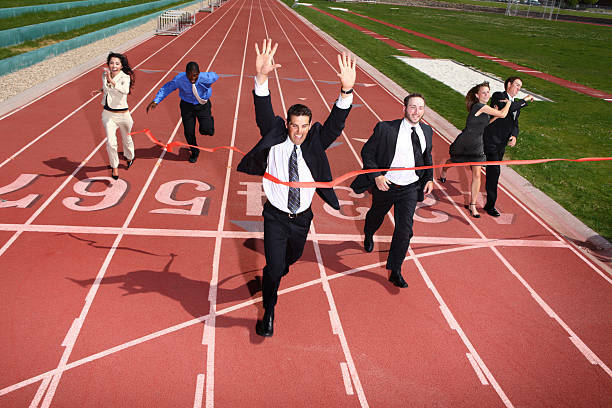 The employees sit in the bleachers to watch the race, hear the results, and then receive the plan for their training practices and workouts, but they don’t get to participate. How enthusiastic would you be to workout and prepare for a race that you weren’t going to participate in? You can have the t-shirt from the race, but no entry and no number. The Appreciative Inquiry framework is inclusive and asks your employees to train for a race that they are very much a part of and want to win. They are included in the training plan, the workout plans, and assigned coaches to help them reach their potential. In this process they have the opportunity to go back and help a fellow runner get across the finish line and they feel the glory when they get across themselves. Instead of being in the bleachers, they ask their family, customers, vendors, competitors, and community to watch as they give it their all and show what they are capable of, and when everyone is there cheering the on, the executives hold back and offer support to help everyone win. In this process, everyone can win together. What does your planning process look like? Are you including your employees, vendors, competitors, and community? Do your employees have a voice, or do they just nod their heads and say things like, “They said we have to…, or “Apparently the new process is…,” which lets everyone know that they’ve been told to do something they do not believe is in the best interest of the customer or the organization. I invite you to consider the power of an inclusive process and whether you want your employees to run the race or watch it.